When I made these roasted carrots and string beans the other night, I immediately thought of my mom who adores them both. Like me, she often uses fresh mint on string beans, but since I had a bunch of velvety soft sage just waiting to be plucked, that's what I used. I was not disappointed. After I made the dish I called Mom to tell her. She and Dad had finished dinner, so, of course, I asked, "What did you eat?" "I made a nice roast pork tenderloin marinated in balsamic vinegar and maple syrup, and I served it with carrots and string beans on the side," she said. "Carrots and string beans, together?" I asked. "Yeah, together, with some soy sauce, mint, and toasted sesame seeds. They were sooo good," she said. "I called to tell you that I just made carrots and string beans with citrus and sage," I said. 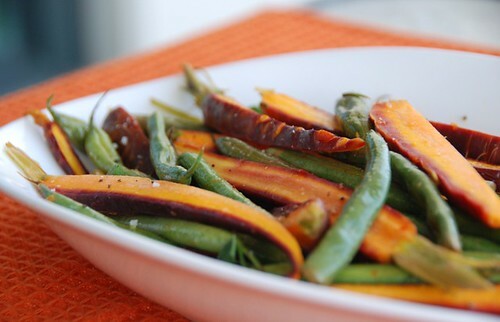 If you haven't paired carrots and string beans yet, you're in for a vegetarian treat. Mini rainbow carrots have recently graced our farmers' markets, and the string beans get longer, plumper, and greener by the week. "Mini" carrots, unlike orange “baby”carrots, are about 5-6 inches long and come in an array of fanciful colors. They're sweeter than regular carrots because they have a higher sugar content. That's why roasting them is so brilliant-- those sugars caramelize, creating a sweet, earthy, tangy flavor that is only enhanced by any variety of fresh herbs. Carrots are highly nutritious as well. They are powerhouses of beta carotene, an antioxidant that lowers your risk of cancer, as well as lutein, which promotes ocular health. The Purple Haze carrots, like I used in my recipe, are high in the antioxidant lycopene, which has been linked to a reduced risk of macular degeneration as well as a reduced risk of many types of cancer including breast, colorectal, and esophageal. String beans are high in vitamins A and C, important health-promoting antioxidants. So the combination of the two vegetables is a double whammy of cancer-fighting nutrients, which is why I'm sending this recipe to my friend Chris of Melecotte. Chris is one of the first bloggers I met online. She's warm, funny, and generous. She's also a cancer survivor. April 29th marks her 7th year anniversary of being cancer-free, and to celebrate, she's hosting her Cooking to Combat Cancer event for the second year. Even if you don't know Chris, I'm sure you or someone you know has been affected by cancer. 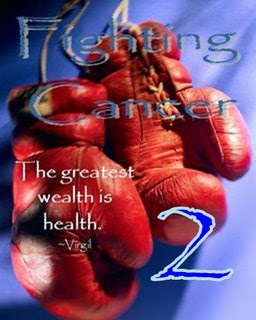 So why not send a cancer fighting recipe to Chris by April 29th? Here's wishing Chris and all cancer survivors many more years of good health and good eating. 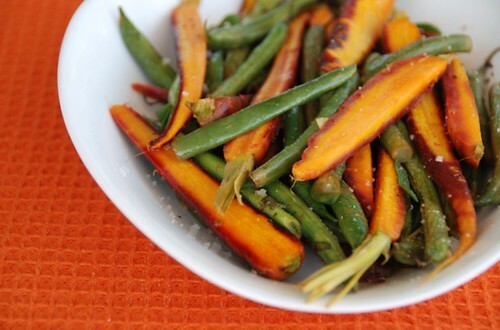 Preheat oven to 400 degrees F. Place carrots and string beans in a large rectangular baking dish. In a small bowl, whisk olive oil, orange zest, orange juice, lemon zest, lemon juice, and salt & pepper. Pour over vegetables and toss until coated. Cover tightly with tinfoil and bake for 10 minutes. Remove the tinfoil. Add honey and fresh sage and toss to coat. Cook uncovered for 20 minutes, or until vegetables are tender yet crisp and a few brown spots appear. Transfer vegetables to a platter or large bowl and drizzle with juices from the baking dish. Season with coarse sea salt and freshly ground black pepper, and garnish with additional sage, if desired. **I used mini rainbow carrots, but any type of carrot is fine. I recommend slicing them to the approximate size of the string beans so they will cook evenly. That's funny, my mom and I will call and do the "what are you fixing?" game too :) Though my stuff isn't so pretty. I will save this for when local green beans become available. I love those purple carrots, and slicing them as you did reveals their orange core. A great entry to a great event! Those look just lovely. I love the bounty of spring. Wow, wow, wow! I love dishes like these that totally let the ingredients speak for themselves! These carrots sound divine. I love the psychic connection between you and your mom -- like picking up the phone to call someone, and finding that person on the phone, calling you. Carrots and beans with mint sounds like a combination I'll be trying this summer, too. What a beautiful dish! I wish I could find some of those mini carrots here -they are gorgeous and sound so tasty! I love it! Your mom sounds great. This recipe will grace the table at Casa Bencomo for sure. You are so lucky to find these beautiful vegetables at this time of year. In RI there is nothing this beautiful right now. I make a recipe similar to this with green beans and leeks, along with a balsamic, garlic, thyme and honey glaze. I will definately try this one, the citrus-sage combo sounds delicious! Again with the beautiful, amazing, readily available produce, Susan. If you're not careful, we'll all move to Southern California and the whole planet will tip off its axis. A wonderful sounding recipe, great story and gorgeous photos. As always, of course. The bond you and you mom have always makes me smile. I wish more could experience something like it, if even for a day. I have never heard of rainbow carrots before....they are beautiful! Makes Orange carrots look a bit...boring! 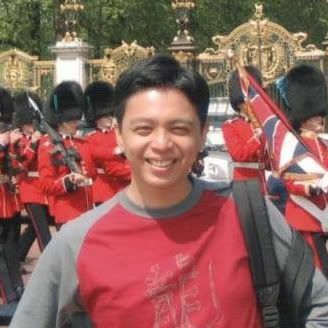 :) Thanks for your continued support and participation - in events, with Mele Cotte, emails, etc. It means a ton! Susan, I love the dialog you have with your Mother! although my Mom passed away when I was 9, I have conversations like that with my kids, we're always talking about food, and what they made. Great post, great dish, great cause!! I love this variety of carrots! Your dish looks awesomely tasty and very refined taste-wise! Beautiful dish and wonderful cause Susan! Best of luck on your entry. Thanks for this posting. Susan, you're killing me with your gorgeous California produce! This looks so very good. Hi Susan - You've inspired me to drive over to the Farmer's Market in Torrance tomorrow morning! Not a big carrot fan, but I think I will try these that you recommend. I have never try this combo before. First time I bought these carrots, I expected them to be purple inside out. simona-Yeah, it was a spontaneous thing, and I was so impressed with the color contrast that I do it all the time now. manggy-What a sweet comment (as usual). lydia-Oh, you'll love them with fresh mint. kalyn-Yay! I can't wait to see how they turn out. annie-I love thyme and honey on vegetables; I'll have to try your combo. margot-And I must try yours. chris-You're worth it! And I agree, everyone deserves a loving mom. marie-Oh, I'm so sorry to hear that. But I'm so happy your kids have a wonderful mom like you. jadeane-Thank you for the kind words. karen-Why not come out for a visit? lori lynn-Really? That's fantastic. I haven't been to that one. But I know the Santa Monica one sells them. 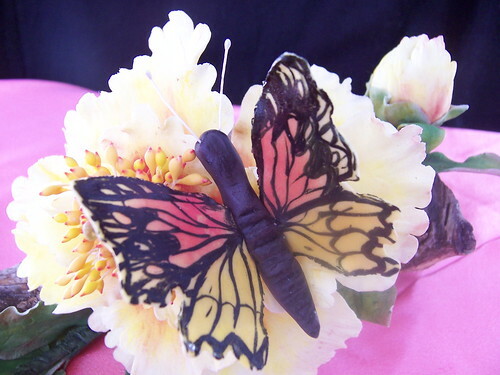 suganya-I know, isn't contrasting color inside just gorgeous? What a gorgeous display of veggies. I never thought to put this combo together, but now I will! Mmmmm! And, your mom... she sounds adorable. What a wonderful relationship the two of you seem to have. Those carrots are so pretty! You're so lucky to have access to such wonderful produce. I feel so deprived! A wonderful tasty salad..wanted to let you know I resent details for the entry and if for some reason you still don't receive it today please contact me at pix4bu(at)yahoo(dot)come. Thanks! Wow Susan that is so neat to have happen with your mom! You are so fortunate! Love the rainbow carrots and the beans. Must try with the mint and the sage both growing like crazy in the back now. Sage was always a favorite with my mom. This dish is speaking to me. I can't wait until the farmer's market is up in full swing this summer. kristen-I'm so lucky to have her as my mom. tanna-Then the veggies with sage will be even more special to you. This sounds great! I hope to find the rainbow of carrots here someday! These look delicious - the combination of herbs, honey and juice sounds fabulous. I found rainbow carrots here once- last year. And haven't seen them since. They were so flavorful. Your combo looks fab. so healthy, and so colourful . would love to have this. cant find carrots like those around here. I admire your thoughtfulness Susan.. The carrots n beans look so so good n healthy.. Great flavors too..
Really delicious Susan, we love carrots too. Orange and carrots are such a top combo too, a winner of a side dish! This dish has beautiful color and sounds like a great combo. I've never had red carrots, do they taste similar to the boring orange ones :D. I'm curious now, they're so pretty and summery! OK, I want to move to San Diego right now and have access to your fresh produce!! What a great story about your mom. It sounds like something my mom and I would have done (my dad used to call us The Clones), had she lived a little longer. The recipe looks fantastic - I'm a great fan of roasting vegetables and new combinations are always welcome. cakelaw-And almost any herb works! kate-You could still use regular carrots. swati-They are really light and healthy. jeanne-There are a bunch of condos for sale right now. ;) I'm sure Chris will have it again next year. I absolutely love honey on vegetables. Has anyone ever tried a new and/or lesser known variety of honey. Recently I discovered jordan river siziphus blossom honey (I bought it from Holy Food Imports, www.holyfoodimports.com) and it really is amazing and unique.